Of course, if you ask anyone who is actually in business about that formula, they are usually quick to point out why their world does not seem to spin on such a simple transactional axis. Fickle markets, seasonality, changes in referral patterns, new competition, or any number of other forces at play seem to keep adding complexity to the ever-changing tides we are swimming in. Throw in a bundle of new technologies, an entirely new way of communicating, which is a bit like language before we had actual language,1,2 and an oncoming tidal wave of metabolic disease, and it is easy to conclude that the conditions are right for a major storm. And yet, this is where it gets tricky. One big wave of wants/needs (status quo) is maturing and moving toward the marketplace shore (boomers) while another very different and yet even bigger wave of wants/needs is just forming in the distance (millennials). Is it possible to catch both waves? If not, which is the right one for your team? How long will we have between waves to paddle back out? 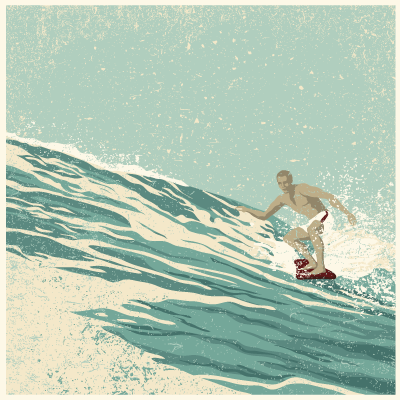 Can we be the Laird Hamilton (big wave surfer and innovator)5 of health care, those who redefine what is possible by changing the game and building entirely new markets? As a provider who has spent most of my professional life helping groups of people wade through the sometimes murky waters of change, most commonly the collective behavior-change to ultimately “tip their population” toward better health, recognizing and respecting this dynamic-at-work is critical. Watching trends shift at what seems like a painfully slow rate (waiting for the wave) only to see it abruptly peak and break has forced me, in both victory (riding a few) and defeat (being crushed by others), into hyperfocus on the early indicators and the forces that influence them. If you, too, have been keeping an eye on the forecast and the horizon, you know what I am referring to. 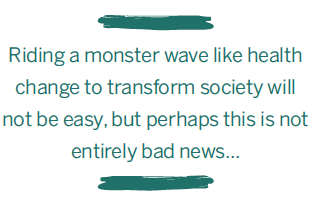 Watching a variety of megaforces—social, economic, technical, legislative, environmental—slowly herd the population toward health change while other forces, on an entirely different vector, make the current system (including providers) look very untrustworthy and poorly equipped, has made it clear that when they meet, a big wave will result. For example, understanding that current estimates place about 60 percent of the adult population in America on at least one prescription medication and 15 percent (more than 2 times the number 10 years prior) on five or more per day6 should tell us a lot about the current wave. Overlaying that with the knowledge that medication errors were noted in nearly half of surgeries,7 that “medical error” is mathematically the third leading cause of death in the U.S.8 and, as we have known for a while, medical bills are the most common reason for bankruptcy,9 and we can quickly see that there is a real problem begging for a solution, and thus an entirely new wave of opportunity begging to be ridden. In addition to those apparent fumblings, if we consider the personal values of these new customers (trust, transparency, social-improvements), the fact that they have watched (and will likely continue to watch) the failing health of their parents who grew up in a “doctor knows best” culture and the estimated gap of +/-100K physicians over the next 10 years,10 it is clear that the opportunity for new frontline health leaders will emerge. The sheer numbers will require these leaders to “keep an eye on” many factors, likely in a high-tech/low-touch way. The new customers’ values will require these leaders to intervene quickly and precisely in a high-touch (and perhaps low-tech) way when the need arises and the size of the economy involved will require it all be done with a lower cost burden per capita. If we understand and respect the forming wave, we can be this leader. Physical therapists who focus on lifestyle interventions such as exercise, nutrition, sleep, stress management, and social connectedness or as my team calls them, “The 5 Elements: move, fuel, recover, endure, connect,” can lead. But, sadly, we will not unless we are willing to anticipate the needs and start getting into position now to ensure we are in the best position before the wave arrives. If we do not do that, someone else undoubtedly will and with the explosion of “exercise science” and “trainers,” they have already started to paddle out. Whether you see it as a bell-shaped curve or a whole new wave, the seas are rising as the storms rage on. 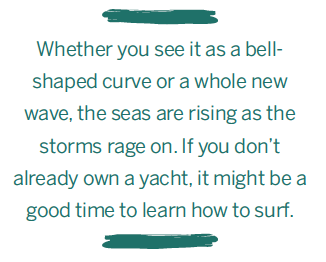 If you don’t already own a yacht, it might be a good time to learn how to surf. 1. http://fortune.com/2014/07/07/bing-heiroglyphics/. Accessed November 2015. 2. www.theguardian.com/artanddesign/jonathanjonesblog/2015/may/27/emoji-language-dragging-us-back-to-the-dark-ages-yellow-smiley-face. Accessed November 2015. 3. www.huffingtonpost.com/emily-cerciello/why-millennials-can-fix-h_b_6071042.html. Accessed November 2015. 4. www.forbes.com/sites/davechase/2015/11/03/millennials-cleaning-up-another-boomer-mess-this-time-healthcare. Accessed November 2015. 5. https://youtu.be/TB-SQhg1z9A. Accessed November 2015. 6. http://jama.jamanetwork.com/article.aspx?articleid=2467552. Accessed November 2015. 7. http://anesthesiology.pubs.asahq.org/article.aspx?articleid=2466532. Accessed November 2015. 8. http://journals.lww.com/journalpatientsafety/Fulltext/2013/09000/A_New,_Evidence_based_Estimate_of_Patient_Harms.2.aspx. Accessed November 2015. 9. www.pnhp.org/new_bankruptcy_study/Bankruptcy-2009.pdf. Accessed November 2015. 10. https://members.aamc.org/eweb/upload/The%20Complexities%20of%20Physician%20Supply.pdf. Accessed November 2015. 11. https://en.wikipedia.org/wiki/Flight-to-quality. Accessed November 2015. 12. www.thelancet.com/pdfs/journals/lancet/PIIS0140-6736(12)60240-2.pdf. Accessed November 2015.